"P.H. Vose Co. Bangor Carnival Parade Float, June 18, 1912"
"One of the strikingly attractive exhibits was the green teakettle, representing the P.H. Vose Co. 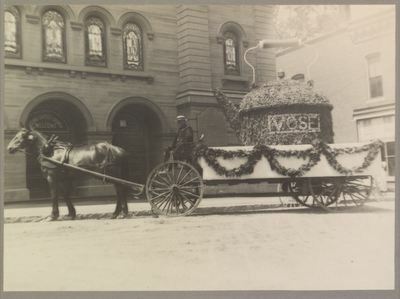 The kettle was covered with evergreen, with the name Vose made of daisies, enclosed in a daisy border. Out of the spout jetted real steam and it received many compliments." The P.H. Vose Co. was located at 55-59 Main Street in Bangor, Maine. Prescott H. Vose was company owner and treasurer. The company specialized in crockery, glassware, and kitchen furnishings.